A return to Resi’s roots, a new first-person perspective and the shock-impact of VR put the horror back into the survival-horror benchmark with a vengeance. If you don't like horror scares then this one won't be for you! Once it reached its fifth and sixth iterations, Resident Evil – the franchise that defined survival-horror – had queasily mutated into a very different beast. Its horror element had more or less been shelved in favour of Hollywood-style action sequences, often bookended by dialogue of extreme cheesiness, and the gaming public voted with its feet. Luckily, Capcom has had a major rethink, and Resident Evil 7 returns squarely to the first Resident Evil game (as well as the Revelations spin-offs) for inspiration. The resulting game is not without flaws, but it should send committed Resident Evil fans into raptures. It's also fully PlayStation VR compatible and undeniably terrifying. From the off, one major change to the gameplay is obvious: Resident Evil 7 ditches the franchise's familiar third-person perspective in favour of a first-person one. That was necessary to allow the game to operate on the PlayStation VR. It sounds like a brave move, but in practice it works beautifully and in no way disturbs Resident Evil's distinctive gameplay feel. It did make us think of The Evil Within a little at first though. So you still lumber around at a pretty sedate pace in Resi 7 (which also helps make it suitable for VR) and aiming your weapons is as clunky as ever. Which may sound antediluvian, but is actually rather comforting – it soon leaves you wondering why it took so long for the franchise to go first-person. Resident Evil 7 review: Where's the game set? Resident Evil 7's present-day setting, however, is all-new: the satisfyingly miasmic swamplands of Dulvey, Louisiana. The (also new) character you play, Ethan Winters, is searching for his wife, Mia, who has been missing for years and apparently sends him a video by email from beyond the grave. His investigations take him to a decaying, abandoned house in the bayou. Since gaining entrance to the house is the first challenge (Ethan starts without any weapons or objects), it instantly becomes obvious that Resident Evil 7 is channelling the very first game of the series. Breaking in, Ethan finds evidence that a number of people (including, amusingly, two frat-boy types making a Ghost Hunters-style show) have disappeared in the vicinity in recent years. Catching glimpses of strange-looking people, you must explore the wonderfully creepy house until, after a series of jump-shocks (which are really effective in VR), you unexpectedly find Mia. But there's something very wrong with her. Ethan manages to embed an axe in her skull, but she cuts his left hand off with a chainsaw, and he passes out. Happy families and all that. On waking, he finds himself in another house in the compound, in the clutches of a hilariously dysfunctional redneck family, who delight in self-mutilation and instant regeneration. At last, a hint of classic Resident Evil-style mutation arrives. You must now employ a bit of stealth by collecting keys, objects and weapons which will allow you to break out of the house and rescue Mia. In its early stages, Resident Evil's full-on horror vibe is surprisingly leavened by some quite effective humour; the cheesy dialogue which polluted Resident Evil 5 and 6 is largely absent. Arch references to the original Resident Evil (and, especially later on, the two Revelations spin-off games) abound, so the general format is very familiar: find key objects, solve door and crawl-space-opening puzzles and locate the specifically shaped keys which open up new parts of the various houses. There are some great puzzles, including some shadow-play ones which will tax your spatial awareness. All the while, the number of mutants you encounter increases. As ever, you start off with a handgun, before acquiring a shotgun (once again the best weapon, it's wondrously satisfying to wield). Later, you can find a machine-gun, a burner (indispensable in one particular sequence) and a home-made grenade launcher. Weapon upgrading has been abandoned this time around, though. The format may be familiar, but it benefits from some tweaks, notably to the crucial inventory system, which is more accessible and less unfriendly than ever before. Occasionally, you find bigger rucksacks which let you carry more gear, but it is still crucial to stash non-essential items in the storage-boxes which accompany the tape recorders (not typewriters, alas) which allow you to save your progress. You still find green herbs, but in common with a lot of other objects, they must be combined with “chemical fluid” to make healing fluid (which is strong enough to reattach your foot if one of the later mutants cuts it off). Chemical fluid also lets you make handgun ammo and psychostimulants that highlight objects you might have missed. Another new convention involves VHS videos, which can be inserted into VCRs dotted around the place and show scenes involving other characters that you can play through – these often come in handy by giving a preview of some of the more arcane puzzles, along with hints about how to progress in areas you have yet to encounter. And naturally, there are a number of boss-battles: the first few are more or less played for laughs, while the latter ones conform more to what you would expect from past Resident Evil games. As in they're bloody difficult. You can play the whole of Resident Evil 7 on a PlayStation VR headset and, happily, the game really works well in virtual reality. There is a trade-off – the lower resolution when you switch to a PS VR is noticeable – but VR hugely ramps up the element of horror, to such an extent that it really isn't for the faint-hearted. It's pant-wettingly scary, in fact. The default control system is slightly tweaked for PS VR: pushing the right stick left or right rotates your character in 30-degree increments, and you can sort of strafe at an angle by moving your head. Once you learn to leave the right stick alone when confronted by mutants in the VR world, and to target your headshots by simply moving your head to aim, everything clicks. Playing in VR adds a glorious extra level of immersiveness – backgrounds which are dark on a TV screen are revealed in all their fetidness in VR, and the ability to poke your head into things means you often spot objects you would otherwise miss. We'd probably recommend tackling the more exploratory sequences in VR, although we did successfully take on some boss-battles in VR, which also had extra impact – it's almost impossible to avoid ducking when a mutant's death-throes shower you with slime. Story-wise, Resident Evil 7 dials things back somewhat, keeping proceedings pretty claustrophobic and intimate until the latter stages, at which point things become a bit more manic. But the story builds in a much more believable fashion than Resident Evils 5 and 6, and includes a few great twists. Cleverly, there isn't much dialogue in the game, but videos and flashbacks fill in the gaps impressively. Resident Evil 7 feels like a really decent horror movie that places you at its controls. It's undeniably terrifying, the first-person approach feels fresh, while its homage to the earlier (and decent) Resi games is a nod to how good the game can be. There are some noticeable shortcomings though. It took us 18-hours to play through in a fairly unhurried fashion, which isn't enormously long, and it really could do with a Revelations-style Raid Mode. At least after the first play-through you unlock a new difficulty level called Mayhem, along with the odd new gun and ability. There's one incongruous note when you play it on PS VR, too: occasionally your arms come into view, which are cut off below the elbow. 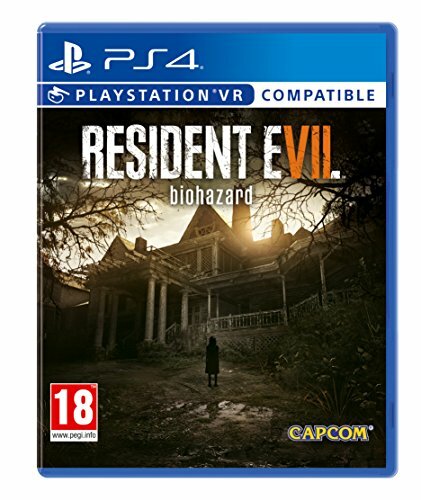 If you're a horror aficionado who craves shocks then you will love Resident Evil 7, particularly in VR. And if you're a fan of the early Resident Evil games and Revelations, you'll also love it. Those of a nervous disposition should probably steer well clear – but for the rest of us, it's a return to form which should have been triggered years ago. Resident Evil 7 is scarily good.